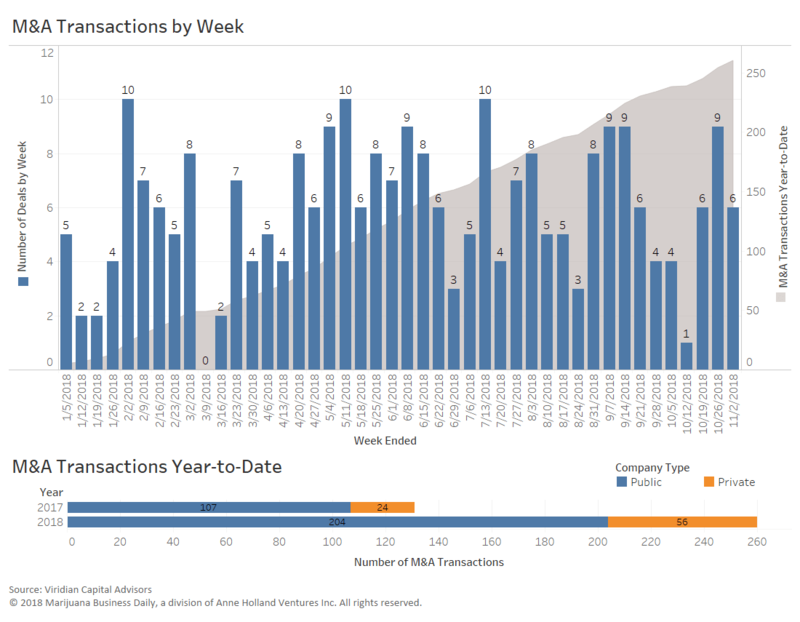 The data below, provided by Viridian Capital Advisors, is through the week ended Nov. 2. 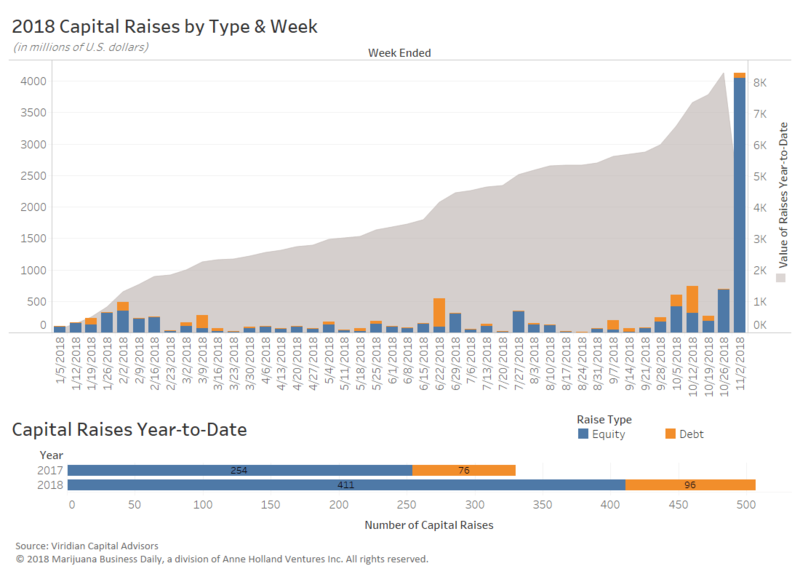 This week was the industry’s single-largest for capital raises, bolstered by the official close of Constellation’s investment in Canopy Growth. Canopy Growth closed on the record-setting, multibillion-dollar investment from liquor giant Constellation Brands, which was originally announced in August. New York-based Constellation’s investment of 5 billion Canadian dollars ($3.8 billion) is the single-largest cannabis deal in the industry’s history to date. “It’s a good reminder of how much institutional capital is still sitting on the sidelines,” Viridian Vice President Harrison Phillips said. Hydrofarm Holdings, a wholesaler and manufacturer of hydroponics equipment, closed a $55 million equity raise. The firm plans to use the capital to ramp up organic growth and seek acquisition targets. The deal, which included private equity firms and undisclosed midtier investment banks, underscores that the “ag-tech sector continues to attract investor interest,” Phillips said. Surterra Wellness, an Atlanta-based medical marijuana company, raised nearly $55 million as part of a funding round aimed at drumming up to $165.5 million. The funding round follows a $65 million raise in August led by chewing gum billionaire William “Beau” Wrigley Jr. Wrigley’s stake “provides a lot of influence for existing and new investors and gives considerable credibility to the business potential,” Phillips said. Invictus MD Strategies acquired a cannabis medical clinic and retail firm in Alberta, Canada, highlighting the growing trend of increased interest in both medical and adult-use storefronts across the country, Phillips said. Green Thumb Industries and Ataraxia Labs announced they have teamed up to acquire an Illinois dispensary from Toronto-based Nutritional High International. The $3.5 million deal expands the footprint of Green Thumb Industries and Ataraxia Illinois and positions Nutritional High to use the proceeds to enter new markets, including Oregon, Nevada and California.